In the usual order of things, lives run their course and eventually one becomes who one is. Bodily and psychic transformations do nothing but reinforce the permanence of identity. But as a result of serious trauma, or sometimes for no reason at all, a subject’s history splits and a new, unprecedented persona comes to live with the former person - an unrecognizable persona whose present comes from no past and whose future harbors nothing to come; an existential improvisation, a form born of the accident and by accident. Out of a deep cut opened in a biography, a new being comes into the world for a second time. Catherine Malabou is Professor of Philosophy at Kingston University London. "Situating the concept of plasticity within the history of philosophy, specifically the work of Hegel, Catherine Malabou has developed the means of invigorating philosophy's relation to science. Here she takes up the challenge of rethinking 'destruction', 'negativity', 'loss' and 'death'; terms which stand opposed to plasticity within the structure of plasticity itself. This work marks a significant development in Malabou's important philosophical project." 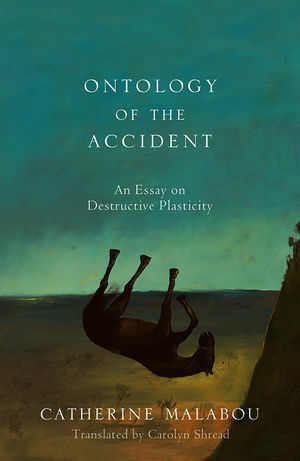 "Through profiles of Spinoza, Deleuze, Proust, Kafka, Duras, Freud and others, Catherine Malabou has produced an exciting extension of her analysis of plasticity in its darkest and most disturbing dimension. Explosive plasticity - catastrophe, breakdown, destruction without remission, repair or promise - sculpts a new deformed form, a deviation in being as a form of being, an adieu to life while still alive, each with a phenomenology of its own. Her exploration of the accident as a category of being confirms once again her reputation as one of the brightest stars of the new generation of French philosophers." Catherine Malabou is a rising star of French philosophy and has a high reputation in the English speaking world. This is the second of several books by her that Polity will publish, the first being Changing Difference. Here Malabou develops her influential theory of ‘plasticity’ by reflecting on psychic and brain trauma. What kind of being emerges from a serious trauma of this kind? Is it a new person, born by accident? What kind of ontology do we need to account for it? This book will be of interest to students and scholars in gender studies, feminist theory, philosophy, literature and the humanities generally.